Taking an aspirin every day might not only help keep cancer at bay, it could also play a life-saving role in treatment, new research suggests. A study reviewing hundreds of thousands of cancer patients found that some of those taking the painkiller saw a significant improvement in their survival chances. When compared to those who didn't take a daily dose of aspirin, these patients were found to be 20% to 30% more likely to be alive at any time following diagnosis. Researchers at the University of Cardiff, who carried out the study, said that these findings show that aspirin could have a valuable role in future cancer treatment. The Cardiff team pooled the results of 71 previous studies to highlight hidden trends. 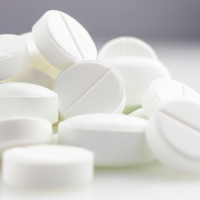 Survival rates of 120,000 cancer patients taking aspirin were compared with those of 400,000 patients who were not. Almost half the studies involved patients with bowel cancer, while breast and prostate cancer accounted for most of the rest. Very few of the patients suffered from serious stomach bleeding, a known potential side-effect of aspirin. The proportion of aspirin users experiencing a serious bleed was no greater than the proportion suffering a bleed due to other causes. Lead researcher Professor Peter Elwood, from the University of Cardiff, said: "The use of low-dose aspirin as a preventive in heart disease, stroke and cancer is well established but evidence is now emerging that the drug may have a valuable role as an additional treatment for cancer too." "Patients with cancer should be given the evidence now available and be helped to make their own judgment of the balance between the risks and the benefits of daily low dose. "Evidence from further studies is urgently required, and patients should be strongly encouraged to participate in appropriate research studies. "All patients should consult their GP before starting new medication." If you've been diagnosed with cancer and are looking for travel insurance that meets your needs throughout the illness, check out our dedicated cancer travel insurance and find a cover that's right for you.